HÀ NỘI — Việt Nam trounced Thailand yesterday at Hà Nội’s Mỹ Đình Stadium and grabbed a berth in the finals of the Asian Football Confederation U23 Championship in 2020. The 4-0 win pushed hosts to the top of Group K after three wins and 11 goals. 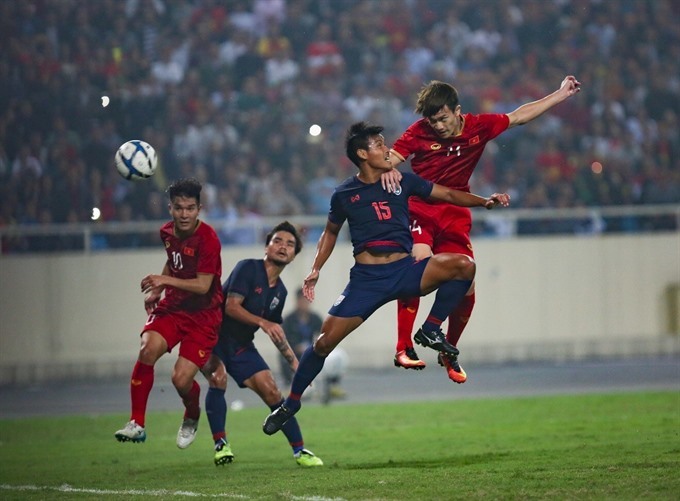 It was also a new record for the team as it was the biggest ever result for Việt Nam against Thailand. Their previous best score over arch-rivals was a 3-0 win 21 years ago in the Tiger Cup, which is now the AFF Cup. Hà Đức Chinh opened the score for Việt Nam in the 16th minute. Defender Đoàn Văn Hậu lofted a ball to Chinh from the halfway line. Chinh, known for missing numerous chances, broke the off-side trap and sent the ball under the Thai goalkeeper. Immediately, fans on Facebook posted cheered that their beloved forward was not unlucky anymore as it was his second goal in this tournament. The hosts dominated the match after the opener, although Thailand tried and failed to break in to keeper Bùi Tiến Dũng’s area. Eight minutes after the break, it was 2-0. Captain Nguyễn Quang Hải left behind three Thai players and ran up the left wing. His pass into the box easily found Nguyễn Hoàng Đức, who scored from close range. The visitors made some changes but were unable to get back into the game. Talented striker Supachai received a red card in the 59th minute for hitting Trần Đình Trọng. Now with an extra player Việt Nam were more comfortable in attack. They netted twice with a goal by Nguyễn Thành Chung in the 62nd minute and substitute Trần Thanh Sơn in added time. Many other opportunities for midfielder Hải, striker Chinh and defender Hậu were missed. Speaking at the post-match conference coach Alexandre Gama of Thailand said Việt Nam played at a high level and deserved to win the match. The Brazilian said not many people could imagine a 4-0 result. Thailand had more possession in the first half but could not enter the penalty area. They changed tactics in the second half but were unable to stop Việt Nam. Thai players lost their competitive spirit and lost the game. Gama said it was his fault. It was simply that his tactics were not successful on the day and he could not explain the reason. He appreciated Vietnamese captain Hải, saying he was a talented player. But after the red card Thailand could not fight back against Việt Nam with such a good player. Hải was voted most valuable player of the match. He said his team prepared well for the game and all members showed their best, so it was no surprise to win 4-0. "We faced little pressure but many supporters came here and cheered on the team. It was a gift for all of them," he said. Thailand finished second in the group but will still compete in the finals as the hosts. In the other match of Group K yesterday, Indonesia secured a 2-1 win over Brunei. Both were disqualified. Forty-four teams took part in the qualification’s 11 groups. The group-winning teams and four best second-placed ones will qualify for the finals.